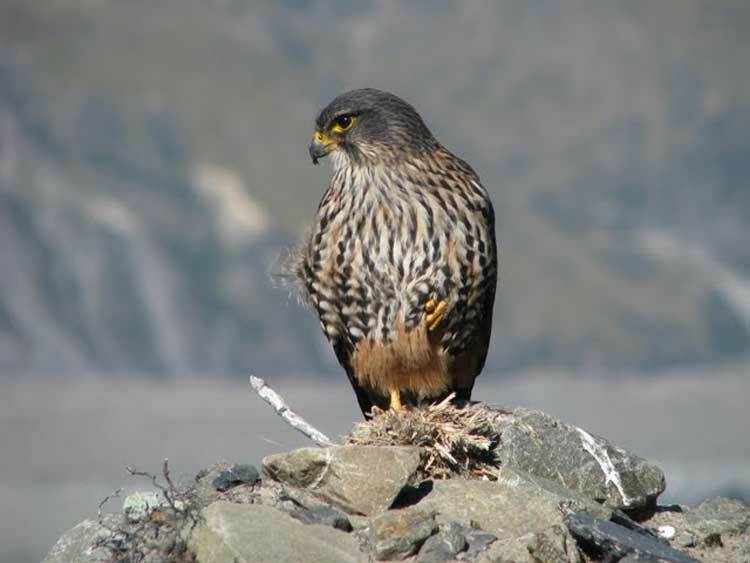 The New Zealand Falcon or Kārearea, Falco novaeseelandiae, is New Zealand's only endemic falcon and the only remaining bird of prey endemic to New Zealand. Other common names for the bird are Bush Hawk and Sparrow Hawk. It is frequently mistaken for the larger and more common Swamp Harrier. A member of the Falconidae bird family, the New Zealand Falcon is mainly found in heavy bush and the steep high country in the South Island and is rarely seen north of a line through the central area of the North Island. A small population also breeds on the Auckland Islands; the species is known only from the Chatham Islands from fossil remains. Although protected since 1970, it is considered to be a vulnerable species. Ornithologists variously described the New Zealand Falcon as an aberrant hobby or as allied to three South American species (F. deiroleucus, F. rufigularis and F. femoralis); however studies of feather proteins suggest a close tie with the Australian Brown Falcon. It differs from the much larger Swamp Harrier, (or Kāhu), which is common throughout New Zealand, in that it catches other birds on the wing, and seldom eats carrion. An aggressive bird that displays great violence when defending its territory, the New Zealand Falcon has been reported to attack dogs as well as people. With a wingspan of about 45 cm and weight rarely exceeding 450g, the New Zealand Falcon is slightly over half the size of the Swamp Harrier, which it usually attacks on sight. The male is about two thirds the size of the female. The New Zealand Falcon nests in a scrape in grassy soil or humus in various locations: under a rock on a steep slope or on a rock ledge, among epiphytic plants on a tree branch, or under a log or branch on the ground, making chicks and eggs vulnerable to predators. In 2005 funding was given by the Ministry of Agriculture and Forestry towards a programme that uses the falcons to control bird pests in vineyards as well as monitoring the birds and establishing a breeding population in the vicinity of the Marlborough wine region. Initially, four falcons were relocated to the vineyards from the surrounding hills. After the release of a further 15 birds breeding began to occur - the first time it is thought to have happened since land clearance 150 years ago. A major ongoing threat to the birds is electrocution on electricity distribution transformers with a fifth of the birds killed in this manner. 2. ^ Marchant, S.; Higgins, P.J., eds (1993). Handbook of Australian, New Zealand and Antarctic Birds. Volume 2: Raptors to Lapwings. Melbourne: Oxford University Press. p. 290. ISBN 0-19-553069-1. 3. ^ Marchant, S.; Higgins, P.J., eds (1993). Handbook of Australian, New Zealand and Antarctic Birds. Volume 2: Raptors to Lapwings. Melbourne: Oxford University Press. p. 287. ISBN 0-19-553069-1. 4. ^ Robertson, C.J.R., ed (1985). Reader's Digest Complete Book of New Zealand Birds. Surry Hills, NSW: Reader's Digest. pp. 154–155. ISBN 0949819972. 5. ^ "SFF Project Summary". Ministry of Agriculture and Forestry. http://www.maf.govt.nz/sff/about-projects/search/05-033/index.htm. Retrieved 25 February 2010. 6. ^ "Falcons Return to Wairau Plain". Ministry of Agriculture and Forestry (press release}. 2007-12-13. http://www.maf.govt.nz/sff/about-projects/search/05-033/press-release.htm. Retrieved 25 February 2010. 7. ^ "Protection sought for vineyard falcons". Radio New Zealand. 2010-02-25. http://www.radionz.co.nz/news/stories/2010/02/25/1247f2c74777. Retrieved 25 February 2010. 8. ^ 2006 New Zealand Falcon coin sets. Accessed 6 April 2006.